The holidays are upon us and I can already feel the stress of getting things done build up inside my mind and body. I’m the first person to raise my hand when putting others first and I’ve learned the hard way (hello adrenal burnout) that my self care routine during holidays is the only way to stay sane. Having said that, it’s not easy. First off, I run a business. Two to be exact. And I don’t want to disappoint any of my clients or blog readers. Second, I’m a wife and mother (to my real kid and my fur kid). Being CEO at work and at home is exhausting but absolutely necessary. I expect to be busy on any given day with the day to day operations of a biz and family. Add in holiday tasks and the scales start tipping in favor of chaos. We spend Christmas with my extended family since we all live close together, so multiply each celebration threefold! 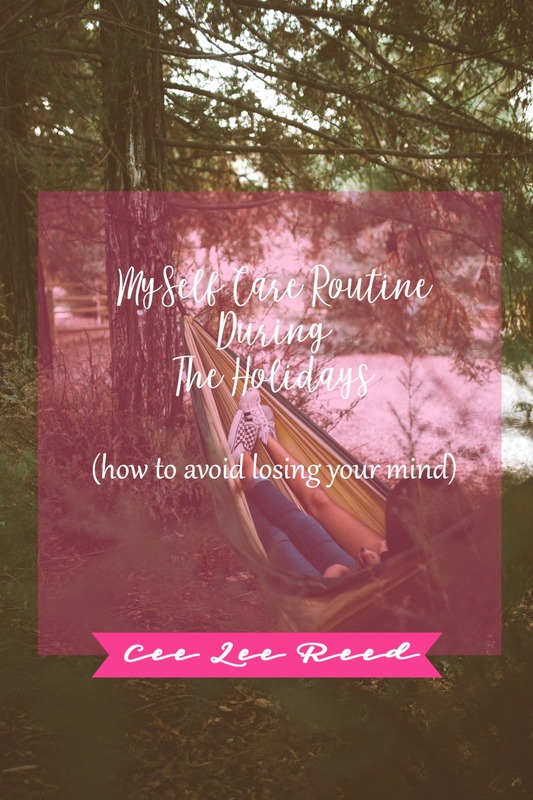 I love every minute of the holiday food and fun but if I’m not careful to create a self care routine during holidays; I’m going to get ill, get angry or lose my mind. Being Boss, much of your time during the holiday will involve working. I keep my typical schedule through most of December except for the week of Christmas. I love building my blog so it doesn’t overwhelm me to work however I definitely find ways to experience the season while working. Listening to holiday music just makes you feel good. I listen to piano music. Remember hearing somewhere that instrumental and classical music stimulates your brain…have no idea if true but I find it’s less distracting than hearing words. Head to YouTube and you’ll find plenty to listen to. Feel yourself getting angry? Turn on some Christmas music and it will fade away. It took me a long time to realize that while I loved the holiday traditions I’d grown up with, they don’t always work with my busy schedule. I’ve had to adjust along the way. Growing up, the tree was put up on Black Friday no matter what. Shhh…as I type this, my tree is still in the attic. Doing things “the way we’ve always done them” can trigger anxiety and stress for me. Rushing to beat some self imposed deadline from 30 years ago does not bring me joy. If you find yourself longing to run away, take a step back and realize that you’re in charge now. Set your own traditions and they’ll love ’em. Take time to go over old movies that make you laugh, cry or just embarrass the kids. Part of my self care routine during holidays is to watch the old VCR tapes (OMGee I need to digitize these) of my daughter as a baby. Cutest. Baby. Ever. Nothing stops me in my tracks like reminiscing over her cute little toes and perfect little bottom. It’s like time stands still and I’m transported back down memory lane. Don’t believe me? Try it. Once you’ve returned to Earth, spend thirty minutes watching Rudolph or It’s A Wonderful Life. Everything else will cease to exist and you’ll give yourself a break. Aren’t holidays the perfect time to do this? 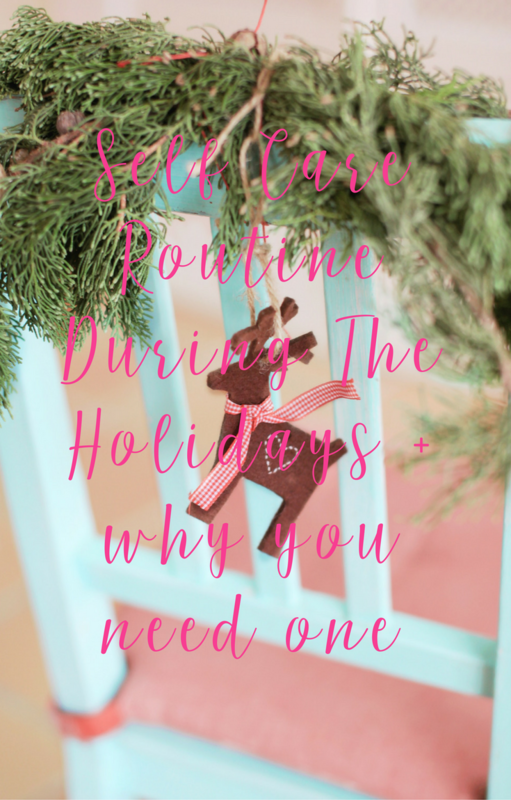 Your self care routine during holidays can only work if you make it a priority. Make YOU a priority. I know it’s hard to put yourself first and decline all those invitations, but you have to. Or you have to get darn good at choosing which are most important. If Uncle Bob’s wife gets drunk and calls you names each year, then stop going! Spend those 4 hours crafting your next 2 killer blog posts. Work with me and you’ll have content in no time. Decide your priorities and do not waiver from that list otherwise you’re inviting stress where it doesn’t belong. This one is on every self care routine during holidays for good reason. Nature, particularly the ocean and trees, has a way of calming us the f-down. Anytime you feel some nasty emotions boiling up, head outside. Or inside, if you’re one of those people that can keep plants alive longer than one week (hate you). Do this during your work day, every day, without fail. Take off your shoes and dig your feet into the grass (easy to say as I live in Florida). Reconnect and ground yourself. Take a few deep breaths and start again. You got this! It’s not uncommon for my self care routine during holidays to include a walk around the block under the moon each night. The holidays bring more stuff. Emotional stuff. Physical stuff. You know to expect it each year so this year, prepare for it. Instead of getting stressed out when that truckload of toys shows up at your front door, be grateful that your kids have amazing grandparents. My self care routine during holidays starts in November when I make room in my home and office. Let’s just call it The Purge! If you don’t want to go all KonMari on yourself, then just remove things that no longer make you happy. You don’t have to do it all at once. I love to organize and part of doing it well is to get rid of the old stuff. I practice self care every month by purging things that need to find a new home. Lady Boss, your office is full of paper, business cards and receipts…take care of it sooner rather than later. Setting business goals and personal goals reminds me how important I am as the head of my company and family (well technically co-leader with hubby). Take care of yourself by laying out a plan of action to achieve the dreams you have. Resolutions are fun but goals are more substantial. Goals require forethought and real planning. They need to be adjusted and audited regularly. Done right, they let you know you’re on track. What better way to be proud of yourself? Set business goals that are keepers and you’ll actually achieve them. And you’ll have a sense of peace knowing the direction of your life for the next 12 months. October through the New Year brings junk food. No way around all that crap. Take care of yourself and try to make healthier choices from the food that’s presented. Most gatherings will include options like veggies or mixed nuts that will give your stressed digestive system a break. Fill up your frig with clean natural foods so that a few frosted cookies won’t do much harm. I try to use December as a detox month. Doesn’t always happen. I just feel better when I eat less during the holidays. Stress messes up my stomach. Not fun. Smoothies are a staple that keep me nourished. Here’s one of my favorite recipes for a Ginger and Peach Smoothie. The ginger calms my stomach and tastes great. TIP: I use ground ginger ‘cuz it saves me time. 1. In a blender, combine ingredients and blend until smooth. Add more coconut milk if necessary to reach desired consistency. Drink immediately. Smile at everyone. Yes, they’ll think you’ve lost it but who cares? Some will actually (dare I say) smile back. Greet your neighbors, the trash man and those bell ringing charity dudes at the grocery store. You can’t help but feel better when you smile. 10. Use essential oils like cinnamon bark, clove and nutmeg. Don’t worry, I’m not selling them; just using them. Holidays tend to bring people together. People together equals more germs and stress and mess. There are tons of essential oils that can help but I have a few I really love because they bring the smell of Christmas while helping me keep it together. Nutmeg fights stress. Take off the lid and take a whiff. Put a few drops in your bath. Lovely. Cinnamon Bark is awesome. The smell is intense and I’m a sucker for things that smell good (in the Top 3 of why I married my hubby). Cinnamon stimulates your immune system to help itself. This is good. I use a few drops in my morning tea or on my toothbrush. Clove essential oil provides a boost of energy when I’m working late in the office. I use it in my diffuser. Remember sticking those clove buds into an orange when you were a child? It was the annual decoration of choice when I was in elementary school and we were still allowed to celebrate Christmas. Anytime I smell clove it instantly takes me back to 3rd grade. Close your office and take a day off just because. One of the best perks of working for myself is that I can close my business down anytime I want. If holiday pomp and circumstance gets to be a bit much, create free space in your calendar. Your readers and clients will understand and appreciate that you are taking care of yourself. No excuses. Stop working. Calm down. Take care of yourself. Self care is always important but particularly during the holidays. What does your routine look like? What needs to change? Tell me in the comments. PS: Want to start your own blog? Check out why WordPress is King and you should be his Queen. You are so welcome. Thank you for stopping by the blog. Loved the list you’ve provided. I have been so/so with my self care routine and j most admit the scale has been tipping towards chaos. I specially loved the recommendations to connect with nature and use essential oils, something I am just getting started to dive into.